Formed in Los Angeles in 2011, The Interrupters are a family affair, comprised of the three Bivona brothers Kevin (guitar), Jesse (drums), and Justin (bass) alongside vocalist Aimee Interrupter. After the success of their second album Say It Out Loud in 2016, they have been touring ever since supporting the likes of Green Day alongside in Rancid in 2017, blink-182, Dropkick Murphys and Bad Religion. So, with high expectations as the band announced their third album in four years, they have collaborated with Grammy Award-winning producer Tim Armstrong and Grammy Award-winning mixer Tom Lord-Alge to channel the raw energy exhibited in their live performances into their latest release Fight The Good Fight. Staying true to the album’s theme of overcoming tough times, Fight the Good Fight opens with the fast-paced energy of Title Holder with the lyrics “Fight like a title holder, stand like a champion / Live like a warrior and never let them break you down”. The energetic lyrics combined with the clean vocal harmonies and fast pace gives it a making it an immediate uplifting favourite, showcasing the band’s fresh energy into the punk world which let’s face it, certainly needs a surge of positivity and spirit. Followed by pop-punk number So Wrong which embraces the fun element of the genre with its slashing guitar riffs and clap-along beat. It is evident from the first two tracks that the album is heavily influenced by Rancid with the simplistic yet enjoyable sound, creating a carefree ambiance whilst underlining the need for positivity to overcome hard times. The lead single She’s Kerosene slips into a triumphantly insightful piece as Aimee reflects on a breaking free from a narcissisticly abusive relationship. “I really hope when people listen to that song, it helps them feel empowered to leave a toxic relationship,” says vocalist Aimee Interrupter. The track definitely achieves the fight song feel with the lyrics “I’ve been burned for the last time!” giving the message that you need to be strong and fight for yourself because no one else can do it for you. Got Each Other brings a sense of unity and family featuring the ska-punk legends, Rancid and album producer Tim Armstrong in some of the versus and the chorus. Understandably, the result is a massive sing-along punk anthem reuniting the friends that become family through music with the chorus “We don’t have much but we got each other”. Next, the brassy and bouncy Broken World was built around a riff and melody handed down from Billie Joe Armstrong during The Interrupter’s tour with Green Day in 2017. With a positive mentality, Broken World makes some key observations about modern society combined with the infectious upbeat “don’t give up” mantra. At this point, The Interrupters have maintained their usual optimistic charm, but it is the powerful anti-love song Gave You Everything that really illustrates how Aimee’s vocal range enhances the album by demonstrating her ability to hit the high notes in the chorus. In contrast, Aimee reverts to a monotonous punky performance for Not Personal, bringing back the feel-good atmosphere with a tremendous guitar solo. The album ends with Room With A View, a eulogy to the death of a loved one. However, it successfully remains lively despite the sombre mood. The album closes in the way it begins, with great energy, emotion and enthusiasm. It encapsulates the power of music, the way that people depend on music to pull them from dark times in life and the album itself does exactly this. The Interrupters have achieved their intentions and more with this album, bringing light and positivity to a dark situation. 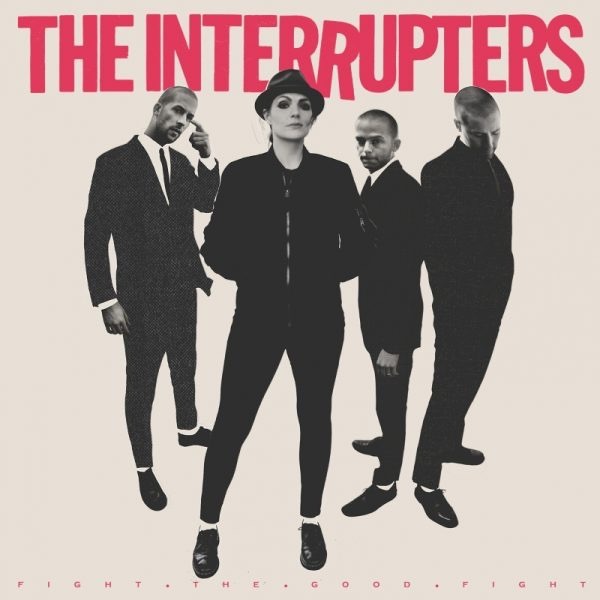 ‘Fight The Good Fight’ by The Interrupters is out now on Hellcat Records.